Heather's Paintings and Musings: Of Gadgets, Potlucks and the crispness of Spring. I returned a short while ago from a potluck for my friend Conrad's birthday. It was a convivial group of us gathered around, carboloading on the various offerings brought by each person. I love small, intimate groups rather than large, raucous ones. They lend themselves to more stimulating discussions without having to raise one's voice over a background din. I also enjoy groups of people from different walks of life, different interests and belief systems, all joining together for a mutual kibitzing of ideas and theories about life, death, or any other topic that might arise. Conrad is a very relaxed host, and that puts his guests at ease as well. I am a horror at hosting gatherings...thus I usually refrain from doing so. Thus getting out allows a time away from the studio. My studio is a bit of a paradox. It is alternately a place of freedom and a prison as well. Perhaps I am being overly dramatic here but indeed it can be a place of great creativity and also great stress...the stress to continually produce, continually come up with unique ideas and different compositions. One day I dream of having a studio with large windows and high ceilings. Hey, I have to dream and dreams really can come true. 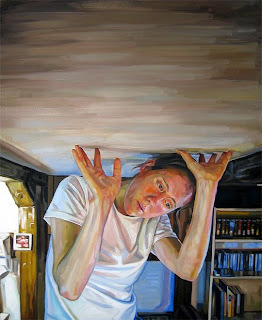 As you can see from my painting "Self-Portrait, Heavy", my ceiling is rather low...that's an exaggeration but you get the idea. I recently purchased a new camera. 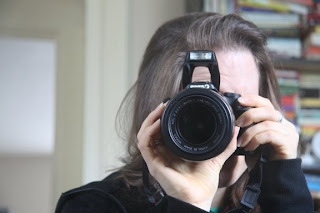 It is long overdue and finally I have a camera that is everything that I need professionally and more. I have been saving for a long time and am confident that it will be a great friend in the coming years. With four journeys on the horizon over the summer, autumn and next spring I knew that it was time to bite the bullet. It is a bit of a behemoth but I look forward to it's assistance in capturing people, places and ideas for paintings in the coming years. I have been advised by a good friend of mine to purchase a GPS. I am traveling to the U.S. this summer and, going solo, it might be a good idea to lessen the possibility of losing my way en route. I know that with a bit of applied concentration that I could probably navigate my way to my destination without incident, but heck, it would really ease the stress of the entire enterprise. I have heard that you can even specify what voice speaks to you...ie. British Woman, American Man, etc. It would be like having your own, unerring co-pilot; one that you can put in your pocket and travel with anywhere. Hey, it beats a map in my books. Walking up to the corner store tonight I was struck with how amazing Spring really is. Many of the new leaves are a chartreuse colour, all without the blemish of drought or blight that can set in later in the season. These crisp days of spring are a treasure; the days and weeks before the inevitable haze of summer, where the humidity is so close to you that it enters your lungs with a disturbing warmth that stifles. I do not like air conditioning and rely upon my body's ability to acclimate instead. But until those dog days of summer the air is cool and sharp, the grass green, midday is inviting and not oppressively hot. My episode of The Artist's Life aired today again on Bravo! Channel. Already I have received a few congratulatory emails from kind friends and new people interested in my work. It is emails such as these that spur me on, keep the creative juices flowing and the self-doubt at bay. I will be sure to post again before the episode airs so that readers might be able to catch the show if they live in Canada. This year promises to be one that is unforgettable. New friends, new experiences and new paintings are just waiting to emerge. I can hardly wait.